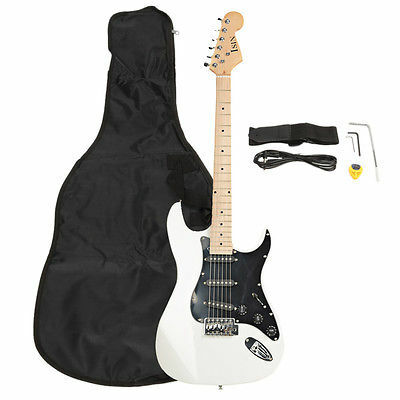 Do you fall in love with this ST Burning Fire Style Stylish Electric Guitar with Black Fender White the first sight you see it? We offer this electric guitar for its perfect performance, stylish appearance as well as its reasonable price. Designed with a black fender plate, this guitar looks more charming and unique than others. With humanized design and high quality, it is durable to use. What is more, the standard tone from this guitar gives you wonderful audio experience. Featuring comfortable hand feeling and melodious tone quality, this electric guitar will be your regretless choice! 8. 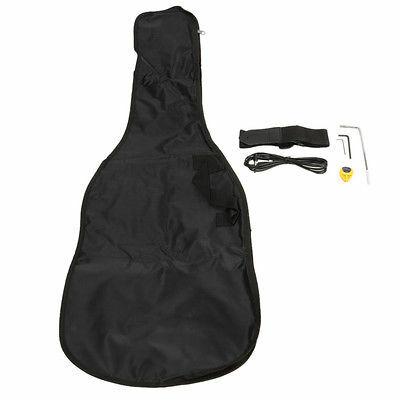 It comes with amplifier, power cord, guitar bag, shoulder strap and plectrum etc. 1. Ship worldwide from New Jersey by reliable shipping companies — USPS, UPS, FEDEX, DHL, etc., and only to VERIFIED PAYPAL ADDRESS. Transport Delivery ETA. Package handling only takes 1 business day at our warehouse, so please make sure entering correct payment and shipping information before checking out. Once your payment is completed, we are not going to accept any more changes to your order. 9. We reserve the right to refuse any returns for objective reasons. 2. If you are satisfied with the product you received,please leave us positive feedback and 5 scores DSR. 1. We offer Laptop, Video Game, Cameras, Computers, Electronic accessories, all our products are chosen from various reputable manufacturers, and are also tested before ship for quality assurance purposes. 2. At YallStore you will get good quality, low price and great service. You will get what you need here. At YallStore, We take every efforts to offer Five Stars Service to our customers. A: Yallstore accepts the payment method Paypal. A: The item will be shipped within 1 business day once payment completed. A: The item ships from North Brunswick,NJ,United States. A: Please log on your account.Click ”my eBay”—–>”My Summary” or open your emailbox and find the shipping notification email. A: Yallstore accepts return.Items must be returned within 60 days.Refunds will be given as money back.Please contact our customer service before you return an item. 1. Payment should be completed within 8 (Eight) days of auction closing. Or unpaid dispute will be filed for closing auction. A: This item will be shipped with 1 business day once payment completed. A: Please log on your account,click “my eBay”–>”my summary”,or open your emailbox and find the shipping notification email. A: Yallstore accepts returns.Items must be returned within 60 days.Refunds will be given as money back.Please contact our customer service before you return an item. Copyright © 2006-2016 YallStore. All rights reserved.